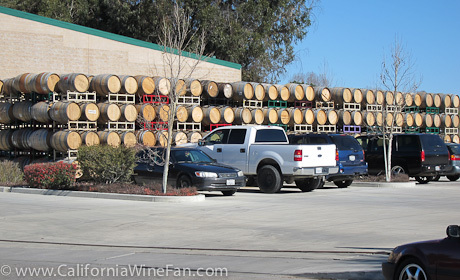 Buellton Wineries? Want to taste wine at a state of the art sports bar and mega winery? 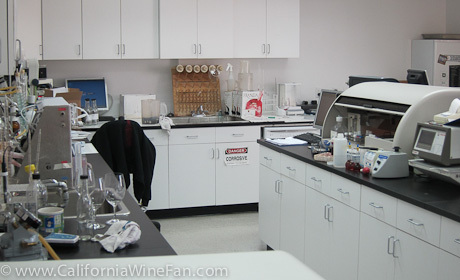 Scores of small Santa Barbara pinot noir winemakers rely on Terravant for custom crush of their personal recipes. Ken Browne and Hitching Post are some of the respectable labels who produce at least some of their product via Terravant. But Terravant also can produce mega volumes of wine for “house labels” for big box chains – hotels, liquor stores, grocers. Terravant produces 250,000 cases of wine a year. 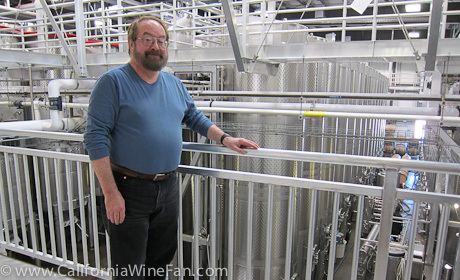 They’re the biggest winery you never heard of. Public tasting is round back, up the stairs in a large, bright sports bar, focused on wood-fired pizza, but with some surprising items, like seared sesame Ahi. You get your wine from a row of automated dispensers, housing about 50 different labels, all vinted here at Terravant. We found several pinot noirs here and tasted Thorne 2008 Santa Rita Hills, Ken Brown 2008 Santa Maria Valley, and Hitching Post 2009 Cork Dancer, Santa Barbara County. Terravant offers occasional tours of their facilities. To find out about them, you need to go to the second floor of the main building, the Avant Tapas and Wine Bar. Ask the bartender about tours. But stay to enjoy the restaurant’s fabulous view of the forest of fermentation tanks. You can walk out onto a catwalk if you want a better view. Before that, however, you’ll want to experience the Wall of Wine. 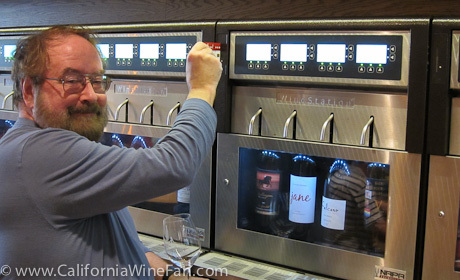 This is an automated winetasting system. Every customer is given a card much like a credit card. This card keeps track of your tastings. For each of the fifty wines on the wall, you can buy a taste or a glass. (Fifty is the number as of June, 2012.) It’s a lot of fun and the staff is very helpful when things go wrong. Of course we were visiting in February, so we pretty much had the place to ourselves. While we were in Avant we met Julie Major, the assistant manager. She was kind enough to refer us to Darren Michaels, the lab manager. It turns out that the lab is a big part of the reason for their success. Darren personally selected the hardware, specifically looking for as much automation as possible in order to handle the high volume of testing. He must have done a good job because the lab staff is Darren and one assistant. 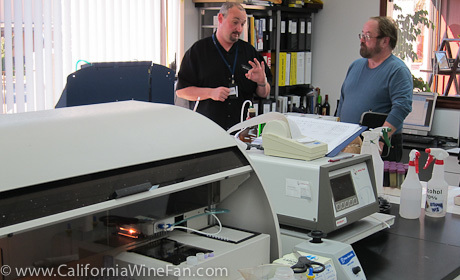 We were fortunate to have Darren give us a tour of the lab. Avant hours: Monday, Thursday, & Sunday: 11 – 8. Friday & Saturday: 11 – 10. A few weeks ago, Norma brought home a couple of bottles of Famille Perrin Côtes du Rhône Village Rouge 2012. Our friends at Artisan Wine Depot (Mountain View, CA, see map below) invited us over for a "French Burgundy vs.